Flatt Lonesome Claims Three IBMA Awards! Flatt Lonesome claimed three International Bluegrass Music Association (IBMA) Awards on Thursday, September 29th during the association's annual conference held in Raleigh, North Carolina. In addition to being named IBMA's 2016 Vocal Group of the Year, the band also won Album of the Year for Runaway Train (Mountain Home Music Company) and Song of the Year for "You're The One" written by country artist, Dwight Yoakum. Read more about Flatt Lonesome Claims Three IBMA Awards! Nashville, TN -- The country's hottest young bluegrass band has recorded a masterful acoustic rendition of one of today's most well-known themes. Flatt Lonesome, in cooperation with Mountain Home Music Company and SiriusXM Radio, has just released a bluegrass version of the main theme from the wildly popular HBO series, Game of Thrones. They’re three-time GRAMMY® nominated, and twice named IBMA Entertainer of the Year. 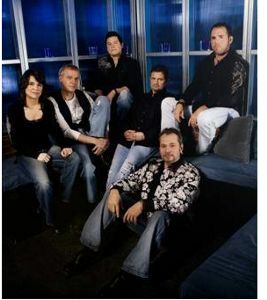 They’ve made numerous appearances on the Grand Ole Opry, and nationally syndicated TV shows. They are The Grascals, now in their 11th year since those early days touring with Dolly Parton, with numerous number one songs and top-charting albums to their credit. And now, a highly-anticipated new release continues their legacy as one of the most powerful and groundbreaking bands in Bluegrass. and then there’s this… is set for release from Mountain Home Music Company on January 8, 2016. Nashville, TN --- Mountain Home Music Company congratulates label artists who received award nominations this week for the 41st annual Bluegrass Music Awards by the Society for the Preservation of Bluegrass Music of America, (SPBGMA). SPBGMA awards will be selected by a vote by attendees during the SPBGMA convention, slated for February 5-8 at the Sheraton Music City in Nashville. Winners will be announced during an awards show starting at 6:30 p.m. on February 8th. Nashville, TN --- The release date for In Session from Doyle Lawson & Quicksilver is January 20, and pre-orders are available now. Mountain Home Music Company will release In Session from Doyle Lawson & Quicksilver in a few days but pre-orders are available now at iTunes and Amazon. For exquisite precision in vocals, harmony and musicianship, Doyle Lawson & Quicksilver’s live shows and recorded projects are unmatched. Nashville, TN --- Artists on the Mountain Home Music Company label garnered the greatest number of nominations of any record label in the recent 2014 IBMA (International Bluegrass Music Association) Awards. When the awards were handed out, Mountain Home artists walked away with six impressive honors. Nashville, TN -- With two recent Grammy®-Nominated albums, and twenty-two nominations in next week’s International Bluegrass Music Association awards, leading Bluegrass label Mountain Home has launched a new website, http://MountainHomeMusicCompany.com, to serve as an informational hub about their roster of multi-award-winning artists. Nashville, TN -- For more than three decades, Lonesome River Band has set a standard that other Bluegrass groups have aspired towards. They have returned to live up to that standard with their first original studio release in four years, Turn on a Dime, from Mountain Home Music Company. Arden, NC --- Members of the award-winning band, Balsam Range, have been back in the studio, putting the finishing touches on the band’s fifth album on Mountain Home Music. Bass player and vocalist Tim Surrett calls the project the “strongest collection of songs” the band has ever recorded. Arden, NC -- Bluegrass legend Doyle Lawson was honored by his record label Mountain Home Music, as Doyle Lawson & Quicksilver were presented with a glistening engraved plaque last week commemorating their song “Dixie Road” topping the prestigious Bluegrass Unlimited Magazine Monthly Song chart at #1 for December 2013. The #1 song “Dixie Road” is from Doyle Lawson & Quicksilver’s 2013 release “Roads Well Traveled” on Mountain Home Music label, a division of Crossroads Entertainment. Nashville, TN -- Two-time IBMA Entertainer of the Year winners, The Grascals, are pleased to announce a promotional agreement with Vietti Foods. The band unveiled a brightly wrapped tour bus touting The Grascals and images of the sponsor’s products.